Aren’t you proud of me? That is a stockinette scarf with tapered ends, knit on the bias. A friend requested it and needed it quickly which worked out well because its simplicity made it excellent vacation knitting. However, a few hours ago it was a couple of feet longer. (Yes, you heard that right.) I had to rip back because I had missed the midpoint of the scarf, knitted right on past it, where I needed to change the direction of the bias so the ends would taper like I wanted them to. This was not a happy realization, especially since he needs this thing by Friday. Oy. Knit like the wind! The yarn’s really nice, though. I haven’t used any with quite so much bamboo content before (77% bamboo, 23% Merino wool) but I’m loving the way the fabric feels. Loose, flowy, cool — dare I say, exquisite. 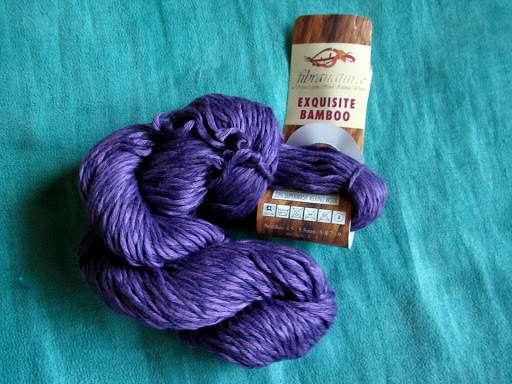 The yarn is currently on sale for half off at Webs, if you’re interested. That’s all I have time for today, folks, I’ve gotta get through about 2 feet of scarf tonight. The Fiasco is highly amused by this project. He calls it my Dr. Seuss scarf. It does kind of remind me of a Thneed. 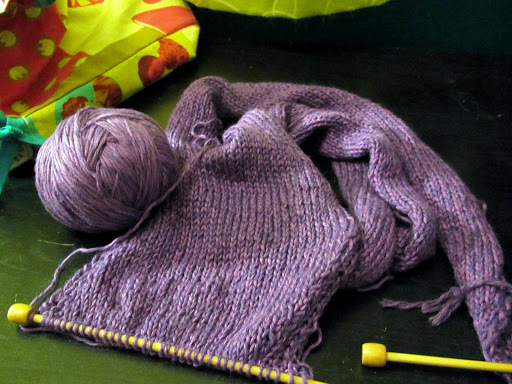 This entry was posted in scarves, WIPs, WIPWed by shoelaceswitcher. Bookmark the permalink. Ouch. Ripping out a couple of feet shows dedication. I hope your friend loves the scarf. Good luck with reaching the deadline. Nothing kills the knitting mojo faster than ripping back feet of a project. Thank goodness it wasn't laceweight! That does look like a lovely summery scarf! I know you'll get it done and it will be stunning! Pretty yarn; I made a pair of socks with bamboo content and really liked working with it. I hate it when that happens. Thanks for sharing. I'm excited to hear about your trip! I love the color that you are using, I could never wear it with my hair color but I'm sure it is super soft! I haven't had great luck with bamboo fitting patterns well so I'm curious to see how this comes out, lovely I'm sure! I would've quit if it were laceweight, for sure. I liked it a lot more than I thought, I'll have to try some more! Blocking went pretty well, but since gauge isn't important for the scarf I didn't have to try to force it to a certain size. My main concern was not stretching it much lengthwise since it'll drape that way on its own.